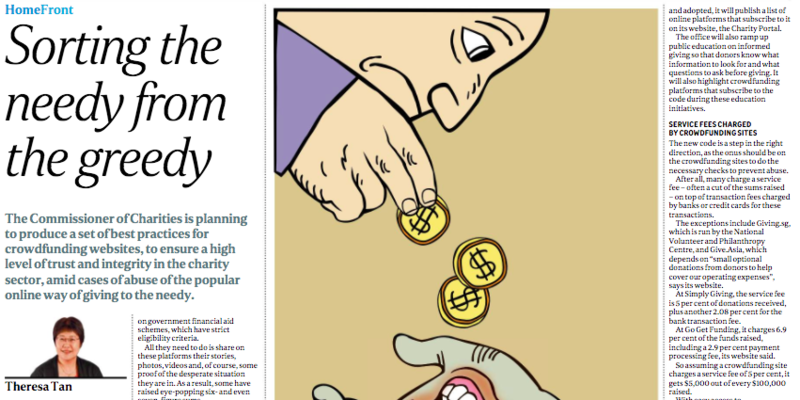 “The growing popularity of crowdfunding sites such as Give.Asia, Simply Giving, and Generosity is both a boon and bane for the public and the government” (Sorting the Needy from the Greedy, Theresa Tan). This is even more critical, if one considers the ease with which potential abusers can turn to other platforms such as direct bank or money transfers to solicit donations for ill intentions. Even though the abuse of crowdfunding websites in Singapore appears to be the exception, rather than the norm, the Commissioner of Charities (COC) is right to work “with key players in the crowdfunding scene to develop a set of best practices for crowdfunding sites” (ST, Nov. 30). Yet missing from this endeavour is a more concerted call for donors themselves to exercise greater discretion when giving money – online, and even offline – and in this vein hold non-profit causes and organisations to greater account. This is even more critical, if one considers the ease with which potential abusers can turn to other platforms such as direct bank or money transfers to solicit donations. The case for donors to be more judicious with their donations is even stronger, given the Singapore-based crowdfunding sites such as Giving.sg and Give.Asia – unlike their international contemporaries – do not charge a service fee. It is therefore not reasonable to expect them to shoulder the responsibility of determining whether an appeal is worthy. In other words, it is not reasonable to argue that “the onus should be on the crowdfunding sites to do the necessary checks to prevent abuse”. At the moment, the suggested “education initiatives” by the COC seem a little too imprecise, especially in comparison to the best-practices proposal for the sites. To help donors make more informed donation decisions, a recommendation could be to publish past cases of abuse – together with analytical information about common features of these cases – to indicate how donors can spot them. This would be a useful starting point, and at the same time successful and genuine cases of assistance can be highlighted too. In addition, cognisant of their limited time and bandwidth, a handy checklist of questions should help donors make quick but informed decisions, for instance: If government or other non-profit avenues have been exhausted, if verification in the form of photographs, documentation, and other finance-related proof has been furnished, and if the recipients are committed to disclosing overall receipts and expenses when the crowdfunding concludes. Such discretion should extend to the donors of charities or non-profit organisations too. It may be inconvenient, though it cannot be assumed that these organisations are channelling donations to the programmes and services which create the most impact. Beyond personal interests of causes – animal welfare, the elderly, or persons with disabilities, for instance – donors should be challenged to seek out more information. Intermediaries such as the National Volunteer and Philanthropy Centre, with the idea of providing donors with useful and actionable details, could model an initiative after United States-based charity watchdog Charity Navigator, which rates charities across the three dimensions of financial health, accountability and transparency, as well as results reporting. Because on a more systemic level, platforms such as crowdfunding sites should be a matter of last resort, and if it is the case that more Singaporeans with genuine causes – who have either fallen through the cracks or are shut out from existing government or non-profit channels – are turning to these sites, then deeper policy questions must be asked.